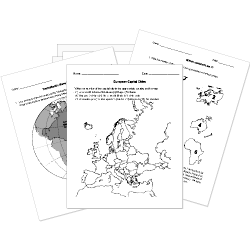 You can create printable tests and worksheets from these Grade 9 African Geography questions! Select one or more questions using the checkboxes above each question. Then click the add selected questions to a test button before moving to another page. is the highest mountain in Africa. The takes up the southern edge of the Sahara. Which river is the longest river in the world? In which geographic region of Africa will you find the Sahara desert? Kenya is a country in . The Suez Canal is a shortcut from the Mediterranean Sea to which ocean? The Zambezi River empties into which ocean? In which geographic regions in Africa will you find the Rain Forests? Which geographic region is most populated? In which geographic region will you find the Namib and Kalahari Deserts? About what percentage of Africa is desert? Over the course of centuries arable land becomes desert. What is this process called? West Africa traded gold for salt with which region?